The Spurs fell to the visitors, 116-96, behind a dispirited all-around effort and an off night from their two All-Stars. At around 3 o’clock on Wednesday afternoon, I peeked out the sixth floor window of my office building, to a sheet of rain clouds that had settled over South Texas since what feels like mid-July, drew my shoulder blades back, and let out the kind of jowly yawn that’s only socially acceptable in the few moments after you wake up. It was completely involuntary, not terribly gratifying, and prompted someone passing by to make a chilling comment about it being Hump Day. And then I yawned again. I was, thus, able to relate more than I’d have liked to the Spurs’ dispirited performance later that night. With LaMarcus Aldridge airballing 16-footers and DeMar DeRozan weaving and pirouetting directly into the stationary arms of Domantas Sabonis, there was a discernible oomph missing from the team that anyone who’s hit a 3pm wall knows all too well. The Good Guys were sluggish on D, couldn’t muster the offensive punch they showed two days earlier in their 143-142 shootout against LA, and generally seemed to sleepwalk through sets on both sides of the floor. 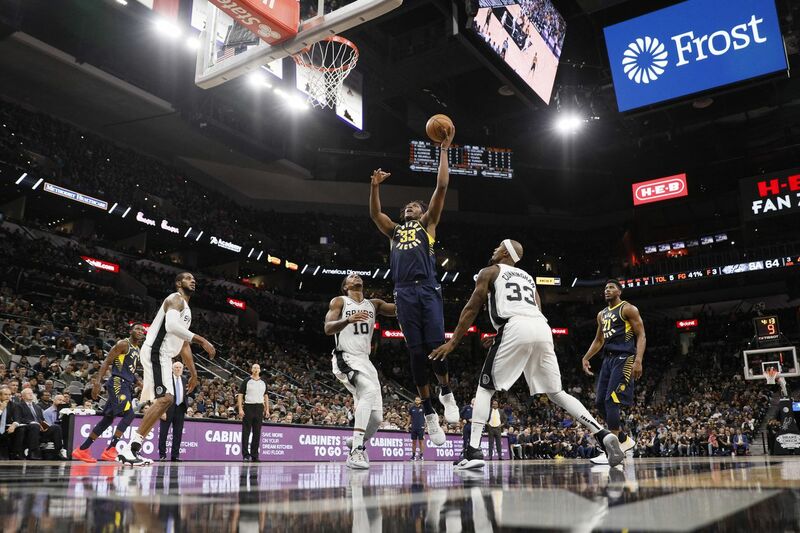 While the 93-possession pace was right up San Antonio’s alley, it was the Pacers who were most comfortable executing in the half-court and methodically picking the Spurs’ defense apart. Victor Oladipo led the way for the visitors with an efficient 21, 9 and 5, but they also got contributions from Tyreke Evans (19 points and 5 assists), Sabonis (16, 10 and 4), and former Spur Cory Joseph (12 points, 6 rebounds and 4 assists). Indeed the Spurs seemed to concede shots to Indiana at all spots of the floor, offering little resistance in the pick and roll and getting worn down by a patient Indiana team that didn’t mind burning the shot clock down before finding a look they liked. The Pacers knocked down 8 of their first 9 from deep, ultimately finishing 17 of 32, and benefited from a 59-35 advantage from their bench. Nate McMillan’s team is good, if not very good, and certainly not the type of group a team like the Spurs can afford to sleep on — their margin of error is too thin right now. Was there a carryover from Monday night’s win in LA? Bryn Forbes (15 points, 4 assists) wasn’t out to make excuses, but he didn’t say no, either. It’s a level-headed — and very Spursy — reaction to a 20-point loss, and one of the many ways that the former Raptor is a seamless fit in black and silver. DeRozan knows this team can bounce back, and that things can only improve as chemistry is developed and the parts fall into place. It could be because it’s Thursday now, or the suddenly abundant amount of sunshine in the San Antonio forecast, but I’m inclined to agree with him. After his strong against LeBron and the Lakers on Monday, it was odd seeing zero points and just two shot attempts next to DeMar DeRozan’s name midway through the second quarter. He found a rhythm shortly after, finishing with 18 points on 8 of 18 shooting. Aldridge was less impactful on offense, scoring 15 on 18 shots. This team can only go so far when both stars are off. After getting the matchup-based DNP on Monday, Poeltl was reinserted into the starting lineup against Indiana, only to see just 13 minutes of total action. He finished with 2 points and 5 rebounds, and didn’t see the floor after getting pulled early in the third quarter. Bryn Forbes isn’t Tony Parker, nor is he Dejounte Murray. Luckily for him, he’s not being asked to be either — simply to bring the ball up the floor, hit shots, survive on D, and make smart decisions with the ball in his hands. He had 15 points, 4 assists, and just 1 turnover in 31 minutes of action.